Description: The renaissance instrument of the Holy Trinity church in Smecno is the oldest preserved and playable organ in the Czech Republic. The instrument was built around the year 1587. The date of construction may be easily recognized by the heraldry of the donors depicted on the organ chest and from extant archive materials. The organ builder is unknown. It is known that the instrument was damaged during the thirty years war in 1631 when the soldiers of the Swedish army stole the Regal - the only reed stop. There has been one major rebuild during its history: in the late Baroque era, in 1775, a small Rückpositiv was added by Jan Rusch from Litomerice and some stops were changed. A partial reconstruction of the organ to the renaissance state was done by Dusan Doubek before 1999. The baroque Rückpositiv was removed and the single manual in the renaissance case was renewed. The original stop names were preserved on the stop jambs and also a large number of original pipes was found inside the organ. This allowed the reconstruction of the special Renaissance sound of the individual stops. However, this reconstruction remained only partial, as the instrument was left at rather high pressure (due to newer pedal pipes - the pedal was not a part of the reconstruction job of Doubek) and therefore the pipes had rather harsh sound. During the years 2009-2010, the reconstruction of the organ continued. 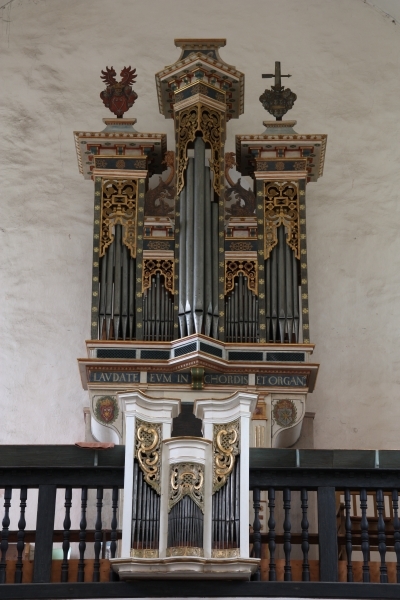 The baroque Rückpositiv is now fully functional, although it remained detached from the renaissance organ having its own keyboard and drawstops opposite to the main case. Organist, therefore, cannot play the two manuals at the same time. Either the renaissance organ can be played alone, or the Positiv alone. However, the decision was made to correct the wind pressure inside the renaissance instrument together with the necessary voicing adjustments and also a number of minor corrections to the tracker, to the windchest and to the mechanical parts of the instrument was done, so that now the reconstruction of the ancient part of the instrument may be considered finished. We are proud that we were able to sponsor this last part of the reconstruction with the money of the Sonus Paradisi project. In our virtual model of the organ, we feature the state of the organ before and after the last restoration. The instrument was recorded before the organbuilders touched it, and after they completed their work. This is where the primary goal our project is achieved: the sound documentation of the given organ in various moments of its history. We are able to present both the variants of the sound of the instrument inside Hauptwerk, side by side, so that every ear may hear how exactly the sound of the instrument changed by pressing only a single button which toggles the before/after reconstruction sample sets. This absolutely unique and innovative way of the sound documentation is allowed thanks to the Hauptwerk technology.